Most people picture bullying as face-to-face conflict. They envision bullies pushing, shoving and possibly hitting others. Maybe they even imagine a child being called names and made fun of. But there is another more subtle form of bullying called relational aggression. With this type of bullying, kids often socially reject, exclude or ostracize other children. This type of bullying becomes more and more evident as kids get into middle school and junior high. It is even commonplace in the workplace. Dealing with this type of bullying can be a challenge for kids. Being excluded causes a lot of pain, especially at a time when peer relationships are so important. Not only do socially rejected kids suffer emotionally, but they also can suffer academically. And if a child grows into an adult feeling worthless, rejected or less valued than others, this can cause all sorts of issues. Although you cannot prevent your child from being ostracized, there are things you can do to help her if it does happen. Here are seven ways you can help your child cope with being excluded at school. When your child opens up about her experiences, make sure she feels safe sharing with you. Avoid overreacting or calling those excluding your child names. Also, do not shame your child for being ostracized. Refrain from saying that she should be different somehow or that she should try harder to be liked. Instead, focus on listening and empathizing with how she is feeling. Communicate that no one deserves to be excluded and emphasize that she has a lot to offer the world. Also, be sure your child can identify the difference between unkind behavior and bullying. Sometimes when kids are excluded, it’s not intentionally meant to harm them. And even though it hurts to be left out, it does happen. Help your child determine if the kids at school were making a deliberate effort to exclude her or if she was just left off the guest list. Regardless of which situation your child experienced, do not minimize her hurt feelings. Both experiences are painful and need to be dealt with. For instance, the stress that she has no control over what other people say or do. But she can control how she responds. Work with her to come up with ideas on how to handle the situation and overcome bullying. The goal is that she would not feel helpless but instead feel empowered with different options. Also be sure your child does not embrace victim-thinking. Yes, what she experienced is unfair and painful, but it does not mean that she has to remain a victim of this behavior. Empower your child to move beyond this situation so that it does not define who she is. Resist the urge to take over the situation, no matter how much you want to. Do not call the parents of the kids excluding your child, but instead let her decide how she wants to handle the situation. Show her that you trust her decisions. Doing so will go a long way in rebuilding self-esteem. It also helps to build assertiveness, autonomy, and strength. Your role as a parent is to be there for back up should she need it. Guide her in how to overcome the situation but do not take over. Your child needs your support, your listening ear, and your empathy, but she also needs to be empowered too. Let her know you have her back, but that you also believe in her abilities to address this situation. Healthy friendships are one of the best ways to prevent bullying. Having at least one friend will give a child a sense of belonging, which can go a long way in erasing the impact of being rejected at school. Look for ways you can help your child develop friendships. Encourage her to make friends at school, at church, on her sports teams, and in other activities. Remind her that the people excluding her are not the only potential friends out there. Instead of focusing on what they are doing to her, she should take control of the situation and look for ways to invite new people into her life. She will feel a lot better about her situation if she makes some new friends. When your children are involved in outside activities, whether it’s sports, yearbook staff, a church group or a reading club, they have an opportunity to make new friends. They also are building self-confidence. Outside activities also give kids the opportunity to release tension, develop creativity and blow off steam. Do not underestimate the importance of getting your kids involved in activities outside of school. What's more, when kids are busy with activities, they are able to be around peers and socialize. The need for social media also decreases because they have face-to-face contact with others. Additionally, there is a lesser risk of cyberbullying and other unhealthy online behaviors because their free time is more productive. Many times, when a child is ostracized it’s the result of other kids being mean. But sometimes kids are excluded because they are lacking proper social skills. This does not mean your child is to blame for being excluded. The bullies and mean girls are still responsible for their choices. But you can help prevent future incidents by helping your child hone her social skills. Also, help your child develop the traits needed to cope with bullying. By doing so, you also will be instilling healthy habits and traits that will benefit your child indefinitely. 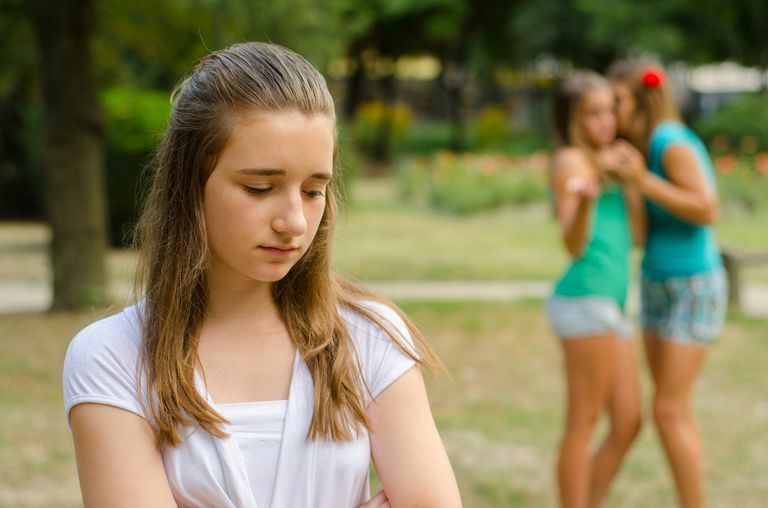 Being socially rejected can affect your child in a number of ways including negatively impacting self-esteem. As a result, it is a good idea to get outside help. A pediatrician or a counselor can assess your tween or teen for depression as well as screen for thoughts of suicide. Even if your child appears fine to you, it never hurts to get a second opinion. It also helps your child to have someone to talk to besides a parent. Outside counselors can be more objective and less emotionally involved. As a result, they may be able to offer tips and suggestions that you did not consider. Counseling also can empower your child to take back the control in her life. Remember, being rejected feels lousy. In fact, some research says it hurts as much as physical injury. So be careful not to minimize how your child is feeling. Listen and empathize with what she has to say. You don't want to be flippant and make the situation worse. Instead, offer patience, encouragement and unconditional love. With a little help and guidance from you, your child can learn and grow from this situation and come away feeling empowered.